Customer group retaliates and brands Currys employees as "bunch of useless retards"
Following news of a Facebook group of some 3000 members where some employees of Currys and PC World call customers “stupid”, it has emerged that there is a customer group of some 60 million members with views on the capability of the employees themselves. DGSi, the parent company of Currys and PC World, has expressed shock at the presence of the Facebook group when news of the activities of former and current employees came to light. One male assistant in Norwich said he was unable to assist with WiFi problems since he was not married. 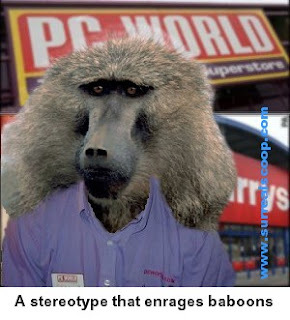 As the online row continues a further group has been set up for trained baboons angry at being compared to employees of PC World. Bit harsh really. I can see why the baboons are so upset.